Hydrogen fuel cell vehicles (FCVs) will catch up to electric vehicle (EV) sales because of the advantage of shorter refuel times and greater drive distances, according to a new report. "Hydrogen fuel cell vehicles, with a zero emission capability, represent future of the automobile," said Naqi Jaffery, the lead author of the report published by Information Trends, a Washington-based market research firm. The report, Global Market for Hydrogen Fuel Cell Vehicles, argues that by 2020, sufficient hydrogen filling infrastructure will be in place in several regions of the world, giving a boost to the market for hydrogen fuel cell vehicles. Worldwide, more than 20 million hydrogen fuel cell vehicles will be sold by 2032, and those sales will generate up to $1.2 trillion in revenue for the auto industry. By 2050, FCVs will be the "fastest growing segment of the auto market," according to Naqi Jaffery, the lead author of the report. While fast charging and longer distances give FCVs a leg up on EVs, the biggest factor that will drive fuel cell vehicles, Jaffery said, is the commitment of the Japanese government and automakers. "Both Toyota and Honda, as well as Korea's Hyundai, have largely stayed away from electric vehicles but are embracing fuel cell technology in a big way," Jeffery said in an email reply to Computerworld. "Both are providing funds for establishing hydrogen filling stations." Honda's Clarity FCV fuel-cell concept car at the Tokyo Motor Show on Oct. 28, 2015. Audi has also announced an FCV -- the A7 Sportback h-tron quattro. Japan will have a network of filling stations by 2020, in time for the Olympic games, Jaffery said. In Europe, Denmark is mostly covered, and both Germany and the U.K. are aggressively building hydrogen filling stations. "Similarly, California is actively involved in setting up filling stations," he added. Several other major automakers are poised to enter the FCV market, and that will trigger "intense competition." In terms of unit sales, the U.S. will dominate the market compared to other countries, but the region to see the highest growth will be Asia-Pacific, Jaffrey said. "Several governments are giving generous incentives to help propel the hydrogen fuel cell vehicle market, but Japan is the most bullish on this technology. The Japanese Prime Minister, Shinzo Abe, envisions hydrogen fuel cell vehicles as part of a 'hydrogen society' where fuel cells will power buildings," the report said. The report divides the timeline for FCV rollouts into three segments - 2015-2020, 2021-2026, and 2027-2032 - and provides forecasts for each of the three time periods. A companion report, Global Market for Hydrogen Fueling Stations, discusses in detail the infrastructure needed to drive the hydrogen fuel cell vehicle market. Ben Scott, a senior analyst with IHS Automotive, disagrees that FCVs will dominate the market someday. While Scott agrees the technology allows for vehicle refueling times similar to those of internal combustion engines and offers longer drive distances, EVs and hybrid vehicles have a cost advantage they will not lose. Today, lithium-ion vehicle batteries cost from $300 to $500 per kilowatt hour of capacity (i.e., from $7,200 to $12,000 for the average vehicle battery pack); batteries are the most expensive component in an EV. That price, however, is expected to drop and eventually plateau at $100 per kilowatt hour of capacity over the next 25 to 30 years as economies of scale and technology improves, Scott said. During that time, FCVs have an opportunity to establish themselves as an alternative, but they're unlikely to do so. The Toyota Mirai FCV's fuel cell stack, which converts hydrogen and oxygen into electrical power for the engine. "Any advantage hydrogen fuel cell vehicles might have at the moment will be negated by the new battery technology we expect to come out over the next 20 to 25 years," Scott said. "So from a cost perspective, it doesn't make sense to invest in hydrogen fuel cells when battery technology is far cheaper." IHS Automotive predicts that by 2027, the annual production of FCVs will be around 70,000 annually, Scott said. By comparison, that same year there will be nine million plug-in electric vehicles produced by the auto industry. "At the moment, there are only three hydrogen fuel cell vehicles you can go out and buy or lease," Scott said. "You need more vehicles to legitimize the market." Another problem fuel cell technology faces is that while it may produce clean energy, the hydrogen gas it requires to produce electricity mostly comes from the fossil fuel industry. Hydrogen gas is currently produced mainly by steam-methane reformation as an adjunct to natural gas and petroleum production. Additionally, FCV refueling stations are exponentially more expensive to install compared to an EV charging station, Scott said. "EV charging stations are pretty easy and inexpensive to install. And, installing a charging port at home can be done for few hundred dollars," Scott said. "If you're looking at installing a hydrogen refueling station -- obviously not in a home, but at station -- it costs millions of dollars. 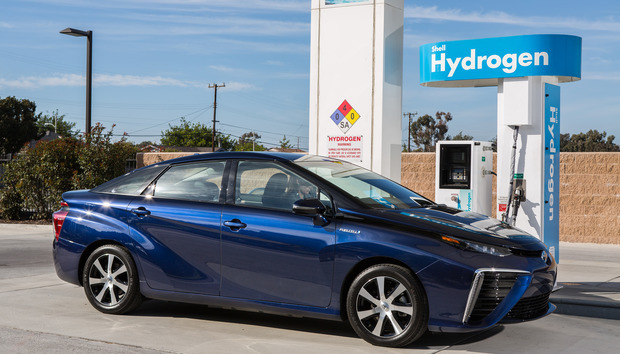 It's a lot harder to deploy the refueling infrastructure for hydrogen than battery vehicles." Steam-methane reformation is a process by which high-temperature steam (1,000 degrees Celsius) creates a reaction with methane gas in the presence of a catalyst to produce hydrogen, carbon monoxide and a relatively small amount of carbon dioxide. The carbon dioxide and other impurities are then removed through a process called "pressure-swing adsorption," leaving essentially pure hydrogen. Steam reformation can also be used with ethanol, propane or even gasoline to produce hydrogen. How a hydrogen fuel cell stack works. While acknowledging that hydrogen fuel production today involves the petroleum industry, Jaffery argued that advances in clean hydrogen fuel production are under way involving water electrolysis technology. Electrolysis uses electricity and a catalyst to create a chemical reaction that separates the hydrogen molecules from oxygen in water. Clean energy sources, such as wind and solar power can be used as an electrical source in combination with water and a catalyst (typically a metal) to generate hydrogen fuel by splitting hydrogen molecules from oxygen. Most often, however, the catalysts are expensive metals, such as platinum (iridium). John Kopasz, a scientist at the Argonne National Laboratory, who performs research on hydrogen gas production, said the largest barrier to hydrogen fuel production remains cost. "Hydrogen made from water electrolysis is a process we've known about for a very long time, but they're still working to bring the cost of that process down," Kopasz said in an earlier interview with Computerworld. "The main cost now is the electricity, but the catalysts are expensive, too." Eventually, Jeffery argued, "electrolysis will be the way to go, but it will take time."